It's hard to take pictures of all my three kids together in one spot...unless I have something new to entice them with! It could be a new cat toy or a surprise kitty snack or it could even be a plain old box I'm about to throw out, like this one here. As long as it's unfamiliar to my cats, they will surely be curious and stick to that something new for a few days. Benji conquering the box. Chubbster & Phoebe not happy! My kids apparently love this old box I was about to trash. And they've decided to make it their new sleeping room. Guess I will be keeping this box for a while then. By the way, this is the last Fluffy Friday as well as my last post for 2010 so let's make it a great one! 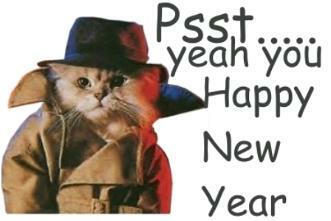 Happy 2011 from all of us here at Meow Diaries and I'll see you next year! Happy New Year kitties.. hehhe..
yelah.. the kiddies loves boxes kan?! 8-) 8-) Caroline Meow 1! Just wanted to wish you a very Happy and Healthy New year. Hugs to all the kitties especially that cute Phoebe. Take care. yay and i saw my name in your commenter list.. :) looks like i can be yr top in here! yippee!!! Happy New Year to Mariuca and fluffball! Nice pics of all your babies. I smile when I see Chubb and Phoebe with their fed-up faces hehehehe....... kesian, your Benji conquered the box tak bagi chance langsung kat your other babies. They are actually like little kids tau, memang leka lihat them and their behaviour at time. Sorry dear, since the link already closed, Insha' Allah, will do my best to post my FF coming Friday. Memang Maxis BB is much, much better than Celcom. Anyway, I took yg laju lagi, contract for 6 months first, see macam mana dulu since I do not have time to register for Streamyx yet! At I bolih juga access to my LT, got no choice have to get BB dulu.